Pack 'n Play already in my DVC room closet. Every Walt Disney World resort hotel room has a posted maximum guest capacity. For example, the standard value resort rooms allow up to four guests to stay there. However, the fine print also states that you can add an additional guest to the room if it is a child under the age of three sleeping in a crib. 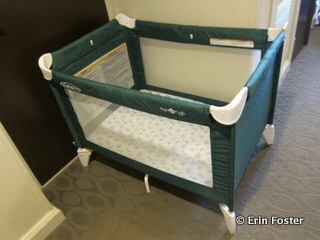 In most cases, the crib that child will be sleeping in is a Graco brand Pack ‘n Play. Here’s what you need to know about the Pack ‘n Play and the “sleeping in a crib” part of your Walt Disney World stay with a baby. What exactly is a Pack ‘n Play? The Graco Pack ‘n Play is what Amazon.com calls a play yard, and what many grandmas would call a play pen. The actual surface that the baby sleeps on is just a few inches off the ground. It is not a proper crib. The mattress is about an inch thick, with minimal padding. While this may not seem particularly comfy for us, it does conform to American Academy of Pediatrics recommendations for infant sleep surfaces. What are the dimensions of the Pack ‘n Play? The Pack ‘n Play is approximately 39″ long x 28″ wide x 29″ high. I don’t really have a sense of what that means. Is it big enough for my child? Assembly instructions printed right on the mattress. Available in English and Spanish. There’s really no need to guess or wonder about this. 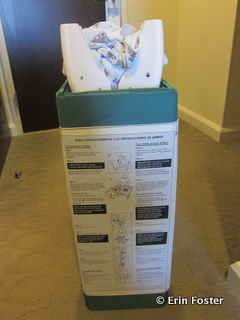 The Graco Pack ‘n Play is an extremely common item. It is available at nearly every baby retailer on the planet. Pop into your local Babies R Us, Walmart, Target, or specialty shop and you’re bound to find a few on the showroom floor. Similarly, if you have friends with young children, it’s quite likely that one of them will have a Pack ‘n Play stuck in a closet somewhere. Find a demo model, pop your baby into it for a second, and see if he or she looks like the fit is good. Please note that the Disney-provided Pack ‘n Plays are the bare bones model. There are no bassinet or changing table inserts available. It looks like it would work, but I’m not really sure. I don’t want to be stuck with something suboptimal on vacation. What do I do? Like I said, Pack ‘n Plays are everywhere. Put out some feelers, and I bet you’ll find a neighbor with one you can borrow for a few days. Try a couple of nights of practice at home. Does Disney provide sheets/pillows/blankets for the Pack ‘n Play? First step. Unhook the Velcro and remove the mattress. Disney will provide a properly size basic sheet. That’s it. Again, the American Academy of Pediatrics recommends that babies have no pillows, bumpers, or other loose materials with them at sleep time. However, if you have a toddler who sleeps with some comfort items, you should be prepared to bring these from home. What are the provided sheets like? This may vary slightly from resort to resort, but in my experience, the vast majority of Pack ‘n Play sheets provided by Disney have a busy Mickey Mouse pattern on them. If you feel this may be too stimulating for your child, plan to bring your own. The Pack ‘n Plays use a standard 27″ x 30″ play yard sheet. 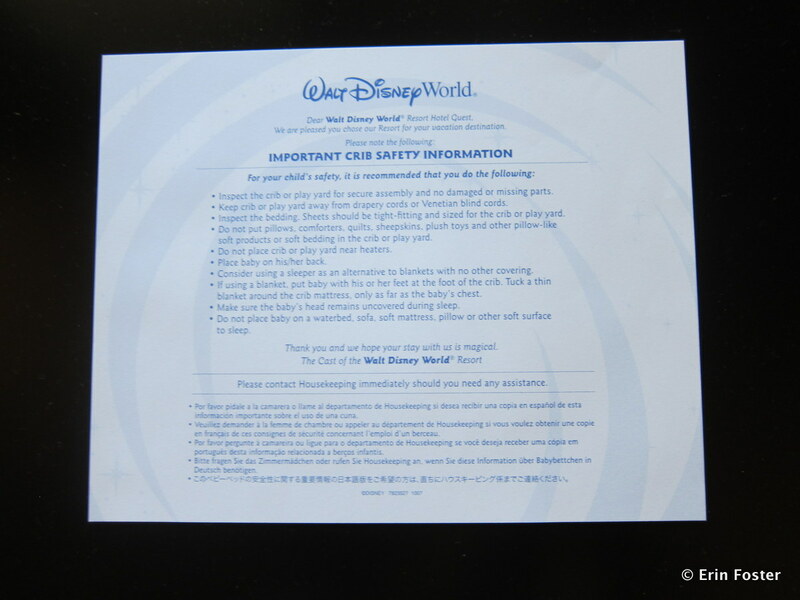 Also, in my opinion, the quality of the Disney-provided sheets is not spectacular. To me, it feels like a fairly rough poly blend. If you want your child to have all cotton or a fine thread count, bring your own. One word of caution: If you are going to use your own Pack ‘n Play sheet from home, you may want to remove it from the crib and place it in a drawer when you go out for the day. Your mousekeeper may not understand that the sheet is your property and might inadvertently send it to the laundry with the other linens. Step two. Stand the Pack 'n Play right side up. I’m going to need a Pack ‘n Play during my stay? Should I request this in advance? If you’re staying at a Disney Vacation Club Villa, either paying with cash or using DVC points, there is no need to make a request. There will already be a Pack ‘n Play stored in a closet in your room. If you’re staying in a regular resort room, then you probably should make the request in advance. You can either do this online or on the phone when you make your room reservation. You can also add the request at a later date by calling 407-W-DISNEY. Ack, I forgot to make a request in advance. What should I do? No worries. The advance Pack ‘n Play request is really a courtesy for Disney. If you forget to let them know in advance, just tell the clerk at the registration desk that you need a crib when you’re checking in. Have no fears that they will run out of Pack ‘n Plays. They have billions of them. Will the Pack ‘n Play already be in my room when I walk in for the first time? Step three. Push down on the center of the mattress and lock the side rails into place. If you’re staying in a villa room, there will be Pack ‘n Play folded in a closet. 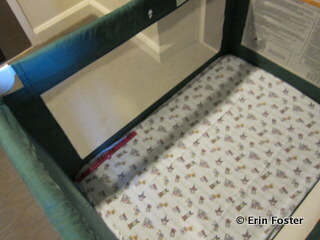 If you’re in a regular room, it’s unlikely that the Pack ‘n Play will already be there when first walk in. This is true even if you’ve made an advance request. Disney rooms are often not officially assigned until the guest actually arrives. If you request a crib upon registration (or remind them of a previous request), then the check in clerk can have the Pack ‘n Play sent up immediately. Usually this will take something on the order of 15 minutes. If it takes more than half an hour, make a follow-up call to either housekeeping or the front desk. 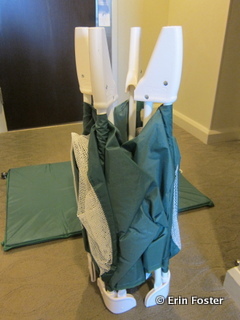 It’s good manners to offer a tip to the bellman or housekeeper who brings the Pack ‘n Play to your room. Do I have to set up the Pack ‘n Play myself? Step four. 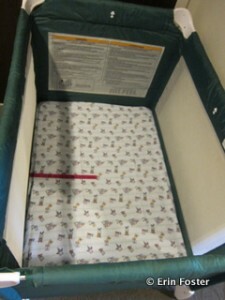 Place the sheet on the mattress and put it on the bottom of the Pack n' Play. Easy peasy. If you’re staying in a DVC villa room, yes, you will. There are directions on how to do this printed right on the Pack ‘n Play itself. My husband would freely admit that he has absolutely no skill assembling furniture of any kind, and he can easily “build” a Pack ‘n Play by himself in under a minute. If you’re having housekeeping bring a Pack ‘n Play to your standard hotel room, then you could ask them to set it up for you. If they do this, offer a tip. Is there a fee to get a Pack ‘n Play in my room? No. 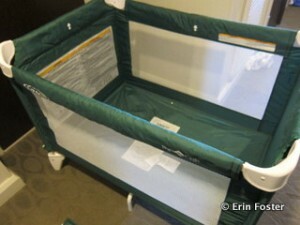 There is no charge for guest use of the Pack ‘n Play cribs. How much space will a Pack ‘n Play take up in my hotel room? Do the math and you’ll find that the footprint of the Pack ‘n Play is about seven and a half square feet. A typical value resort room is 260 square feet, meaning that the Pack ‘n Play takes up about 3% of the room. At first glance this doesn’t seem like much, but once you take away the closet and bathroom space, the foot prints of the furniture, and any other large gear you’ll be storing in the room (double stroller, anyone?) and the tiny play yard can quickly feel like a big deal. One foot ruler in the Pack n' Play to give a size reference. Take a peek at this excellent visual of room size comparisons and you’ll get a better feel for how much space a Pack ‘n Play will really consume in each room type. Obviously, the smaller the room, the larger the imposition will be. I mention this because even though technically you can put two adults, two medium sized kids, and a baby in a Pack ‘n Play into a room at All Star Sports, the reality is that you’ll feel VERY cramped if you do so. Any tricks to making the Pack ‘n Play seem less intrusive? There’s not much you can do in the standard value resort rooms. The Pack ‘n Play will just be there. The moderate resort rooms typically have a sliding door panel or curtain that separates the main living area from the bathroom area. Some guests choose to place the Pack ‘n Play behind that panel to give the illusion that the crib is in another “room.” Of course, if you have to use the bathroom, you’ll end up in the baby’s space with the possible risk of waking him or her. Deluxe resort rooms are often large enough so that find a fairly unobtrusive corner for the crib. I have twins. Can I get two Pack ‘n Plays in my room? As long as you’re within the stated room capacity, then yes, you generally can have more than one Pack ‘n Play in your room. I am the mom of twins myself. There were a few WDW trips we took when both my twins did sleep in their own Disney-provided Pack ‘n Plays. In each of these cases, we stayed in deluxe level rooms. Even then we felt a bit cramped. Of course, in addition to the two Pack ‘n Plays we also had a double stroller for the twins, and a single stroller for their big sister, plus lots of other random childcare related gear. In my opinion, if you have young twins, spring for a value resort family suite or a moderate resort room at the very least. The one foot ruler from another perspective. My baby has trouble sleeping in the same room as me and/or I have trouble sleeping in the same room as my baby. Check out our hotel room sleep strategies for some ideas, but in general if either you or your child is a particularly light sleeper, then you should consider a situation where you’ll be able to sleep in separate rooms. These include the family suites at either the Art of Animation or All Star Music value resorts; a one, two, or three bedroom villa at a Disney vacation club resort; a suite at a moderate or deluxe resort; a Fort Wilderness cabin; or off-property accommodations. I’ve tried to get my baby to sleep in a Pack ‘n Play and it’s just not happening. Are there alternatives? Yes, SOME of the Disney resorts MIGHT have a few traditional style cribs available for guests to use. My understanding is that these simply do not exist at the value resorts. At the moderate and deluxe resorts, they won’t advertise that traditional cribs are available, but you might get lucky if you ask nicely. Disney will guarantee guests use of a Pack ‘n Play. They will not typically guarantee guests a real crib. Also, while these may be traditional style (raised off the floor), most will not be full size, and will instead be slightly shorter and narrower than your home crib. This is sometimes known as a hospital-size crib. Standard warnings. Click to enlarge. That’s not going to work for me. I need to have a guarantee that my child will have a real crib. There are number of Orlando area agencies that rent child care equipment, including cribs. If you make a reservation with them, you have a contract that you will have a full-sized crib. How do get the crib? Do I have to pick it up? 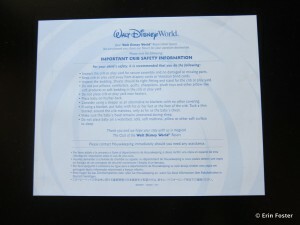 Most rental agencies will deliver and retrieve items from any Walt Disney World resort. Make sure you discuss procedures for this when making your rental. Will I have to assemble a rental crib? This may vary from agency to agency, but generally yes. Typically, you will receive all the crib components in your room, but you will have to put it together. Do you have any recommendations for a crib rental agency? I have never personally used one of these services, so I feel uncomfortable making a recommendation. I do have several friends on the Disney Parks Moms Panel who have had good luck with A Baby’s Best Friend, so that may be a good place to start, but there are also many other options. My two-year-old is too big for a Pack ‘n Play, and too mature for a crib, are there toddler bed options at the Walt Disney World hotels? Not exactly. Many of the deluxe resort rooms include a daybed which would function well with a small child who is used to sleeping on a real mattress. Also some of the moderate and deluxe resorts MIGHT have rollaway cots available. The rollaway situation is akin to the full-sized crib situation; they are stealth items that no one will admit exist. You might be able to ask nicely for one, but chances are you won’t get a guaranteed yes. If you are able to get a rollaway (like a regular twin bed), there will likely be a daily fee for this. I have never personally heard of Disney having low toddler-size beds available. Hmmm, do you have any other ideas? Disney does have bed rails available to borrow. Just pop bed rails on the regular room in your bed and you’re good to go. You should request these in advance because there are a limited number in circulation. Also, A Baby’s Best Friend, and other services will rent toddler beds and deliver them to your hotel. Alternatively, if you travel a lot and/or have several children, it might make sense for you to invest in your own portable toddler travel bed or cot. Take a peek on Amazon.com for some alternatives. Some of them options may end up costing less money than a temporary rental. Do you have any photos of the Pack ‘n Play? Take a look down the side of this post. The Pack ‘n Play pictured was already in the closet of my Bay Lake Tower studio room when I arrived in early 2013. I’ve been a frequent Walt Disney World visitor for 15 years. The Pack ‘n Play pictured here is identical to every other Disney-provided Pack ‘n Play that I’ve seen on property during that entire time. Fellow travelers, do you have any other questions about the crib situation at Walt Disney World? How did your Pack ‘n Play experience go? Do you have any recommendations for crib or toddler bed rentals? Let us know in the comments below. My family used a Pack n’ Play at the Wilderness Lodge last month. While it’s a decent product, my 15-month-old daughter would not sleep in it. She’d sleep for an hour, then pop up and let us know that she wanted in the bed. Her sleep was much better on the regular mattress. I’d forgotten how thin the mattress is in the Pack n’ Play. It’s not the best. If you’re going to use one, I’d bring your own fitted sheet from home. The sheet provided was cute, but we’re a little obsessive about cleanliness. 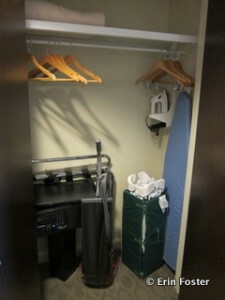 Be sure the mention the need for a Pack ‘n Play at check-in, even if it has been noted on your reservation. Sometimes I’ve found a Pack ‘n Play already in my room (good job, Disney! ), and other times I’ve had to call to follow-up on my request at check-in (not so good job). My kid slept exclusively in a Pack ‘n Play for four months starting at age 16 months, and he survived the thin mattress. Plenty of humans sleep on dirt floors every night, so it’s not like we’re genetically programmed to sleep only on Swedish foam mattresses or whatever. Of course, some people (babies included) will be pickier, but I’m glad mine wasn’t because it made staying at hotels (Disney or elsewhere) viable. In value rooms, I’ve been able to push the table along the TV cabinet and put the crib along the wall. You can’t sit and do anything at the table, really, but I never do that, and at least the crib is out of the way. It also fits between the door and the nearest bed, but that isn’t a great option if you plan to be using that door while the kid is sleeping. I avoided putting it near the bathroom because value resort toilets when flushed are REALLY loud. For what it’s worth, I had a robust portable crib on wheels (not a Pack ‘n Play) at the Swan last summer. Those are more bed-like, but I don’t know whether I was lucky or if this is standard practice for the non-Disney-but-on-Disney-property Swan/Dolphin resorts. I had a heck of the time actually getting this crib delivered (a different story entirely), but it worked out well once it arrived. We will be traveling with a 3-year-old in our party next year (in addition to our 18 month old), who might not be ready for his own bed, but is definitely too big for the pack n play. We’re staying at BLT…would it be possible to remove the mattress from the single-sleeper-chair and put it on the floor? If that doesn’t work, he could probably share a bed with mom or dad, but if he could have his own “bed,” that’d be ideal. I’ve never tried this myself, but my guess is that it probably would work well. If for some reason it didn’t work out having the mattress on the floor, you could probably push one side of the chair against a wall and block the other side with a desk chair and/or some extra pillows. We had a split stay in December one night at ASM and a week at CBR, When we got in our room at ASM it was set up and waiting, so the next day when we checked in to CBR I assumed the same would be true. It was not so when I called the front desk they said they don’t have them already in room for you and you have to ask, no big deal had in 15 minutes. Not sure if the value and moderates have different procedures. By the way it was the same pack-n-play we have at home, and yes bring your own sheets not only for cleanliness but for comfort. I think if it smells like home they may be more inclined to sleep well. 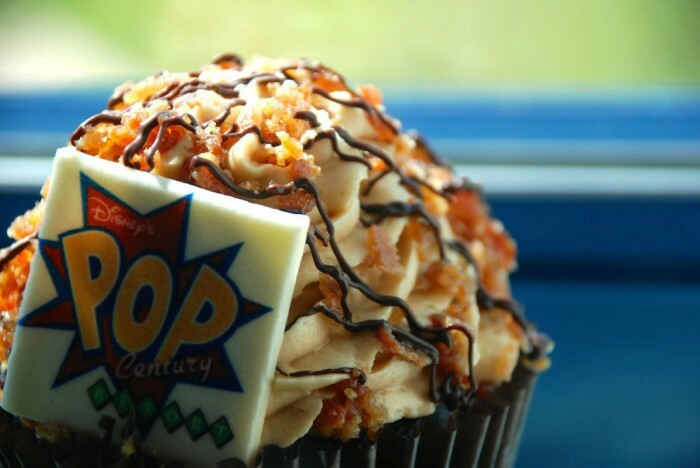 We spent March 3-7, 2013 at the Pop Century with a pack-n-play provided by Disney. The pack-n-play was clean and well constructed. I felt very comfortable with my child sleeping in it. In our value resort hotel (Pop Century), we were able to put the pack-n-play behind the curtain that separates the sink from the rest of the bedroom. We just put the pack-n-play partially in the closet and partially in front of the sink. It was a little awkward for tooth brushing, but otherwise it worked great…and it was nice to have a curtain between her and us. 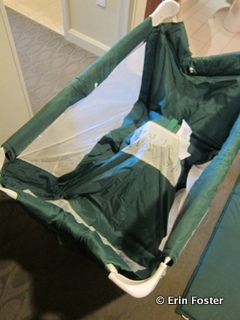 My only complaint: the provided sheet did not fit the pack-n-play’s mattress well. Its elastic pulled the edges of the mattress so that the mattress could not lay flat. This was no good! Luckily, I brought a sheet from home, so we were in good shape. FYI: my daughter was 15 1/2 months at the time of the trip. When my kids were toddlers…We took the cushions off the sofa and put them on the floor in the corner. We asked for an extra sheet and bed rail and they loved it. We have also gotten an inflatable pool raft for rooms that don’t have sofa cushions. An inflatable raft packs small and does double duty – pool toy during the day and inflatable bed at night. We use one of the extra blankets in the room for padding – I just wrap the blanket around the “mattress” board as well as I can, then put our crib sheet from home over that. This works well for my two-year-old. We also bring her pillow/pillowcase and favorite blankets from home, as recommended in the post. She fares pretty well with this arrangement. We have a Pack N Play that we used for my son when he was a toddler. A few times we used it as a travel crib when sleeping over a Grandma & Grandpa’s house. We would fold a comforter so it would fit at the bottom to give extra padding to the mattress area. Otherwise the mattress is really thin and uncomfortable for sleeping. My daughter, now 3, is a “diva” sleeper. It has to always be a certain way for us to even get a bit of rest. We got the child’s Aerobed off of amazon. It is the size of a toddler bed, has bolsters when inflated, and works wonderful for our family! It’s also easy to travel with, it fits into a large duffel bag when flying. It does squeak when she rolls around, but it doesn’t wake her up. Is there room for the crib in the bathroom of 1-bedroom villas? Specifically thinking about BLT.